The weather in Germany has turned hot. Anything much over 22 degrees and it’s too hot for the Velomobile (at least for someone with as much personal insulation as I have). So Alfie has been getting a few more rides recently, mostly in company with his new friend the Steintrikes Wild One (which seems, unfathomably, to not have a name). A few exchanges of SMS yesterday morning with fellow-triker Klaus and a cycle ride was arranged for the late afternoon – with the Netherlands as our destination. Once again I drove Alfie to Klaus’s house (he lives 20km away) so we could ride from there. It makes more sense than meeting up somewhere underway, especially as Alfie easily fits into my Honda Jazz with the back seats down. I have now also improved my skills at handling him when folding and didn’t end up covered in oil this time! Last Thursday evening I also rode with Klaus and on that occasion when I unfolded Alfie he had a few minor problems – partly related to his advanced mileage I think. This time, with my improved skills in lifting him folded, after I reassembled him he seemed unscathed. Which was good as this ride would also see him cross the 20,000 mile mark. Klaus had plotted a route for me which is one he rides occasionally. What I hadn’t noticed initially is that it goes up a pretty steep hill almost straight away. And boy was I slow – it was 29 degrees, I had spent all day at my desk working before heading out, and I am rubbish up hills anyway. This was cycling across the Süchtelner Höhen, this very inconvenient moraine that is in the way if you want to go west from Viersen. There are lots of different routes across it of various steepness but Klaus sent us the Höher Busch route which is through some woodland so not asphalted. He took a wrong turn and we started going down a nettley path so had to turn round again – recumbent trikes and nettles and other similar vegetation do not mix well. 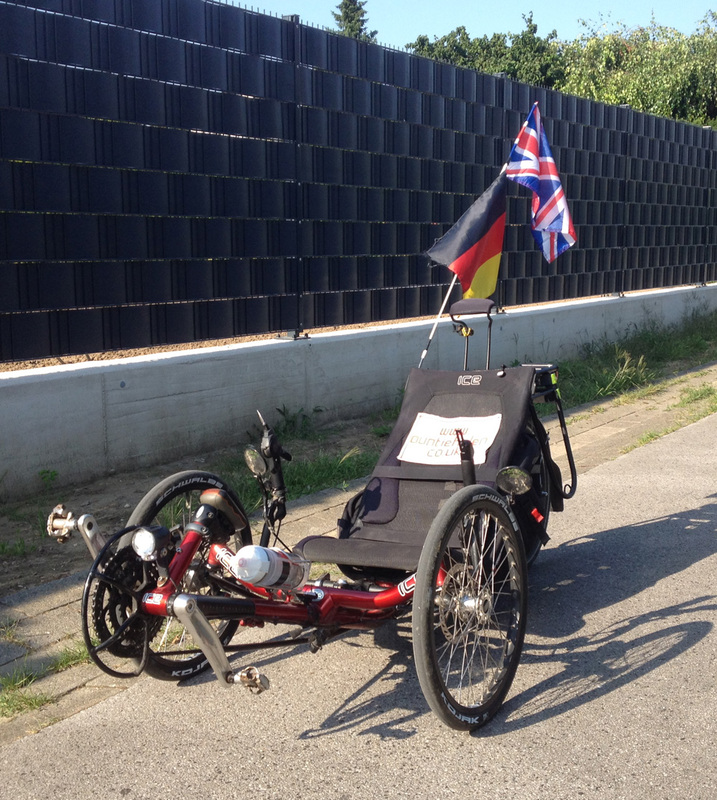 Anyway I was slow going up the hill – this is not news but previously I have blamed the fact that it is because I am on a recumbent trike (known for being slow up hills). When I am cycling with someone else on a recumbent trike and they are whizzing off into the distance when going up hills this rather shows that my slowness might be down to the rider rather than the machine! However I am quicker downhill than Klaus. We had discovered this on a previous ride, that I freewheel downhill much faster, and had discussed a little whether this was because of differences between the trikes or maybe that the Wild One’s tracking wasn’t perfect. I had a great idea to do a test by swapping machines before a downhill and seeing if the ICE Sprint was still quicker. The answer was no, with me riding the Wild One it went much faster down the hill after we crossed the A61 Motorway. The obvious reason would be that I have greater mass (= heavier) than Klaus but this would clearly be embarrassing for a lady so instead we have been trying to work out other reasons for this speed differential. We are currently working on the hypothesis that I am way more aerodynamic than him. I like to try to fool myself from time to time! Anyway, having struggled up the side of the Süchtelner Höhen (and seen two other recumbent trikes going past but they didn’t stop for a chat) and had our race down the other side, we were now on flat territory rolling through Bistard, Boisheim and the unfortunately-named Schaag. There is a church in Schaag that I haven’t yet visited as part of my Churches in Kreis Viersen challenge but as we had 70km to ride and had only left Viersen at 5:15pm I thought it best not to delay us by stopping to photograph it. I learned a few useful bits of information from my riding partner today when discussing the different roads. In the UK we have motorways, A Roads and B Roads (do we have C roads? I think not, I think they are just ‘unclassified’). Anyway, in Germany I have seen A roads, B, L and K but didn’t know exactly how these were specified. It turns out to be quite simple – A = Autobahn (I did know that), which is motorway. B = Bundestraße which is a national road. L is a Landesstraße which are the major main roads within a country and K are something to do with Kreis (district), I didn’t pick up the exact word. So the B, L and K roads are all of the quality and speed we would call an A road in the UK, but I guess different departments pay for maintenance/upkeep. Or something. From Schaag we headed out into some very flat farmland towards Bracht which I have visited a few times (but from a different direction). Whilst we were trundling along beside a road I suddenly realised that Alfie must have crossed over his magic 20,000 mile mark (unfortunately the mounting point for my bike computer wheel magnet thingie had snapped a few days ago so the trike’s trip computer wasn’t working, I only had my Garmin). So I stopped to take a photo of Alfie after his 20k miles – he doesn’t look too bad for having travelled that far in three years, all weathers. I’ll be writing a blog post about the 20,000 miles in due course. Klaus made the mistake of saying to me that he doesn’t like riding in groups normally because it’s tricky to ride safely with other different bikes (a well known problem for recumbenteers – exacerbated by the fact that all you see in front of you are people’s backsides) but that he found it much easier to cycle with me. As we were riding side-by-side at that time I did a quick swerve towards him to see how he reacted. The answer was quickly, and nearly steered himself into a ditch. Oops! I wouldn’t have hit his trike (I am too sensible for that!) but clearly caught him out. Later in the ride he tried to do the same to me but I didn’t budge – I am made of sterner stuff (or more trusting?). Either that or I am now immune to this as yesterday I was cycling with an upright bike whilst I was in Penelope and there was a braking issue and the cyclist crashed into the side of Penelope. No harm done but after that I was feeling fairly invincible as of course I was entirely protected within the shell of Penelope. 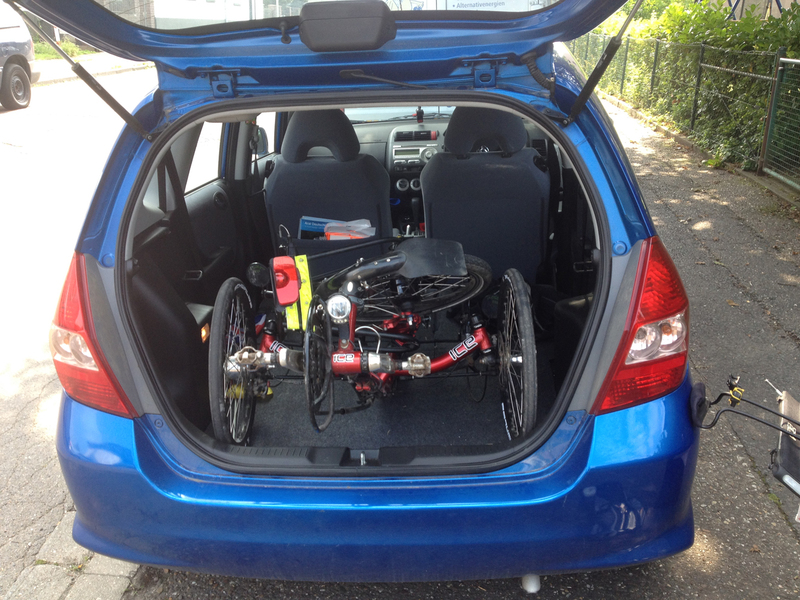 But the basic situation is indeed that two trikes riding together find it much easier than a trike with an upright bike (or even recumbent two-wheeler) as the speed and braking profiles/performances are much more similar. From Bracht we crossed under the B221 and then headed through the hamlet of Heidhausen before entering the Brachter Wald. I feared we might find lots of mosquitoes but there weren’t any – it was probably too hot for them! The journey through the Brachter Wald is a long, slow downhill which gets steeper at the end until the border with NL where you have to do a 90 degree right turn through some traffic calming. I decided to see how fast Alfie would roll downhill with me on board – we managed to hit 47.9 km/h which was a bit disappointing (I did 60km/h when going down a short hill back in England a couple of weeks ago). 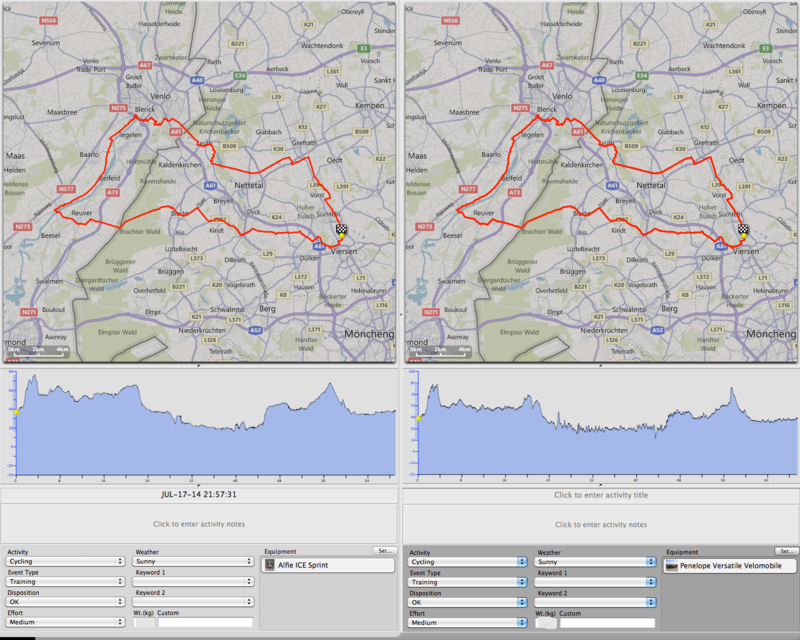 I think it just isn’t hilly enough in Niederrhein to really get going. Which is actually a relief. 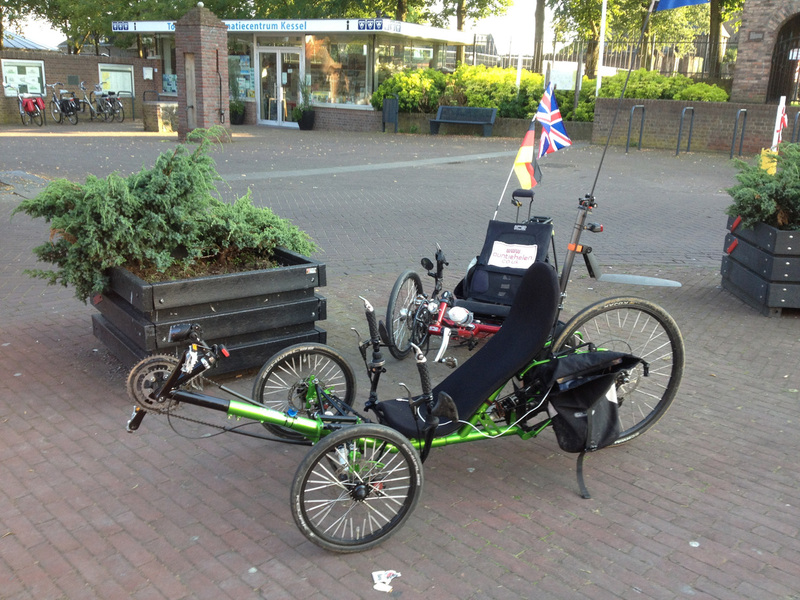 We crossed the border into the Netherlands at the De Witte Stein pub where we had been with the Trike Treffen group. There’s nothing obvious to make you realise you are in NL until you travel a bit further and come through the towns where you see different road signs and also slightly different designs in buildings. I was now in a phone blackout though (I don’t use data when roaming) which meant all went very quiet on my phone – my husband is currently doing a sailing challenge of going round the British Isles (well, halfway round). He has just joined the boat in Oban in Scotland and they are making their way down the west coast. He’s been sending lots of iMessages to update his location and send photos of the amazing scenery – but once I crossed into the Dutch phone area it all went quiet. Which felt quite odd really. 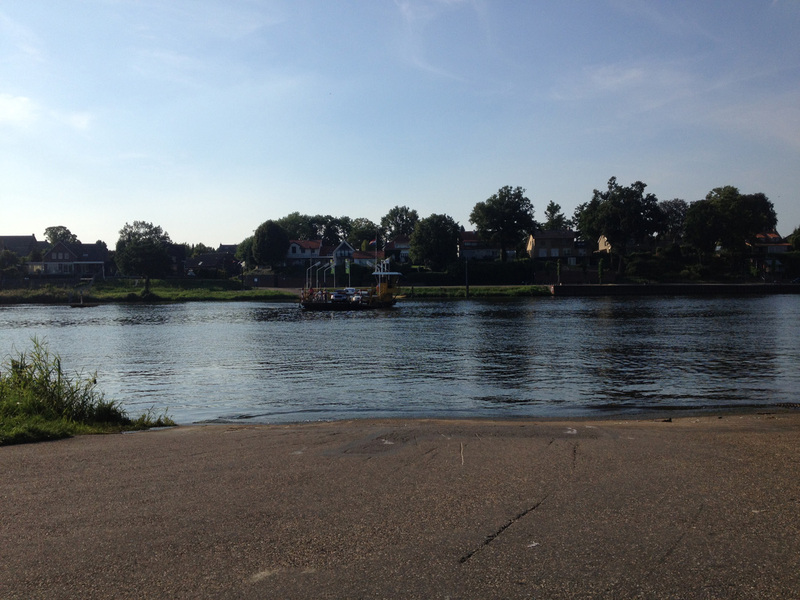 We rode through Reuver and were soon at the Maas river, where we had to wait for a minute for the ferry. It is worth noting at this point that there was an ice cream van selling ice creams near the ferry point but I said nothing. Klaus’s last blog post suggested I kept whinging about lack of cake on our rides so I had resolved to be quiet about the fact he seems to ignore the need to refuel whilst underway. Which was mostly successful, in that I didn’t whinge, but an ice cream at that point would have been fab! We rolled onto the ferry and the chap who came to take our 60 cents for the crossing had a good chat with us in multiple languages (a mixture of English and German, we couldn’t quite fix on what language we were going to speak). 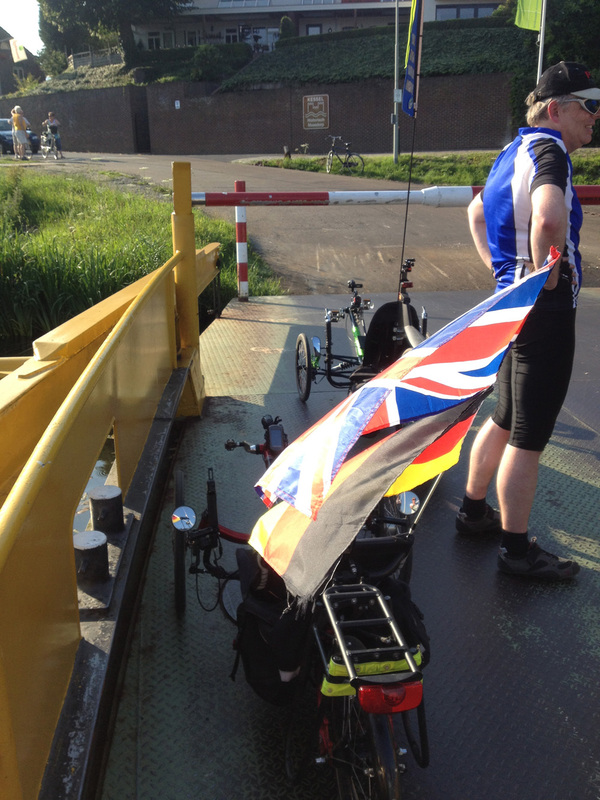 Here are the trikes on the ferry as we have almost reached the other side. It was a chain ferry and the river is probably less than 100 metres wide at that point. We got off the ferry (I had an unexpected bit of heel strike due to the steep ramp, which might explain why the heels of my cycling sandals seem to be coming unglued) and then headed into the little village. There were several cafés and Klaus asked if I wanted to stop for a drink. I said no as we weren’t yet halfway round the tour and then checked on my Garmin – it said 25km to go, and we’d already done 29, so I changed my mind. Halfway point is a good time to stop. We found a nice café with some shade (it was still really hot) and stopped. I ordered a cup of Teewasser/hot water for tea with milk and miracle of miracles, that is actually what I got! In Germany I usually don’t get any milk, despite specifically asking for it, and then have to wait for ages for them to remember. But I had my tea and then a glass of water and enjoyed a bit of a break from the sun. It was time to get going again so we headed off on the road alongside the Maas. 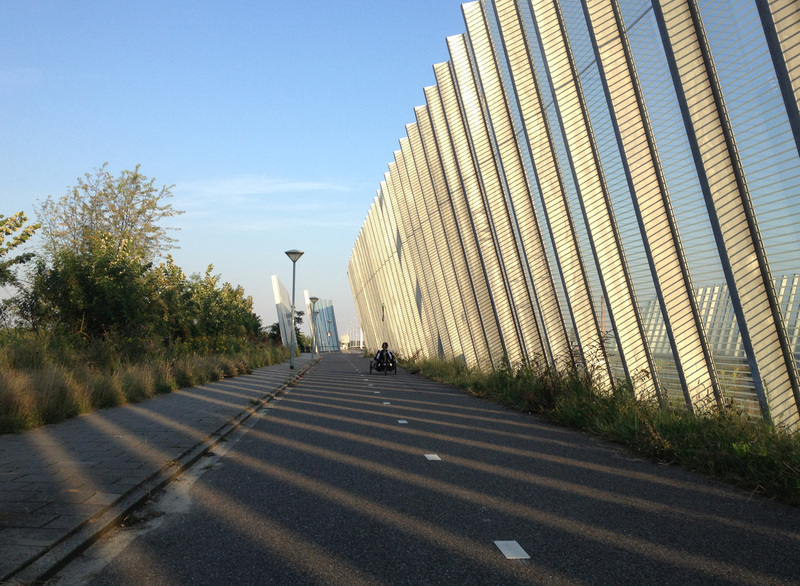 It’s not just a cycle path, there were some cars and quite a few mopeds whizzing along. There were also loads of roadie cyclists in packs. We weren’t overtaken that often though because we were riding at a decent pace. At one point I heard a nasty grinding noise from the back of my trike when rounding a corner – only to discover that I still had my parking brake on. It’s not a very effective parking brake but it does make you work harder if you ride for two kilometres with it on! What was annoying was I could see that my light was flickering (I have a front light permanently burning on Alfie as it’s from the dynohub). I couldn’t tell if the fault was from the dynohub, the cabling or within the light itself but a bit of fiddling suggested that it might be the on/off/senseo switch which might possibly have experienced some water ingress in the last three years. It seemed to sort itself out after another 10km but it’s something I need to watch as I didn’t have a backup light with me – I will need to start carrying a torch as well in case something happens to the light. The other thing I noticed was that my Garmin was counting up with the ‘distance to destination’ field. This is because we were doing the track the reverse way round than normal and I hadn’t realised this. So when we stopped with 25km to go that was actually false – we had another 35km to go. Well at least I had enjoyed my cuppa by the Maas. I didn’t actually know where I was a lot of the time – just following someone else makes for very easy routefinding (unless they lose you!) but meant I kept asking where we were. This roundabout had a useful series of signs on it so I could tell roughly where I was. The section cycling along the Maas seemed to go really quickly for some reason – perhaps because it was a fairly fast, wide track. The views across the river were very nice and there were even some hills in evidence. 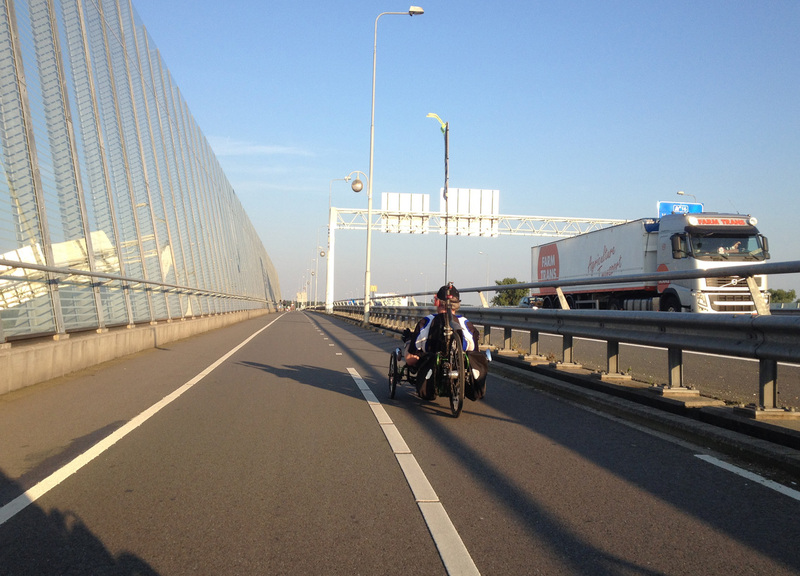 The plan was to cross the river again in Venlo on the motorway bridge (the A73). This is a shared motorway/bike bridge and is quite impressive. You feel well separated from the traffic which is good. 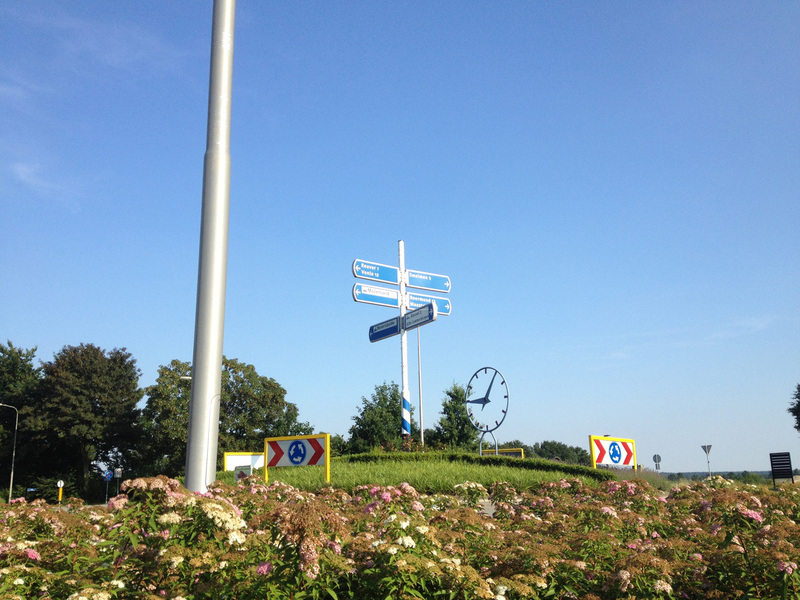 From there Klaus wended a route through Venlo to the east and I was completely lost. I kept thinking I recognised sections but then was in unfamiliar territory again. I assumed we were heading to the Glider Airfield which is the route I always take out of Venlo but no, we were going by Leuth instead. We crossed back into Germany, passed another as-yet-unvisited church in Leuth and then headed towards the De-Witt-See, joining the Bahnradweg (which I cycle at least once a week) to head back. This is such a great bit of cycle track – smooth, straight, wide enough for two trikes side-by-side (mostly) and not very busy at 9pm at night. We whizzed along, passing Sassenfeld where I had a week’s holiday in August 2012, then the top edge of Lobberich before heading towards Grefrath. Because our final destination was Viersen rather than Kempen we left the Bahnradweg before Grefrath and had to go up a bit of a hill – which seemed unexpectedly hard! – before heading to Hagenbroich, around Vorst and then to Süchteln on the Nordkanal route before arriving back at Klaus’s place. As usual he sped up for the last few miles (presumably thinking about home cooking and cups of tea and things like that) so it was all I could do to hang on. A booster rocket would be useful to help me keep up in these situations. Alfie was packed away into the car in no time at all but I needed a few minutes’ breather before heading off as I felt really tired after the last few miles. I’d run out of water which probably didn’t help. By the time I had driven home I felt back to normal fortunately and had a very good feeling after such a good cycling workout. Just under 70km for me and I burned over 2000 calories which was a bonus – and only had a cup of tea on the ride! Klaus records his track with an iPhone App and I have here the two data files side-by-side when imported into my cycling software. 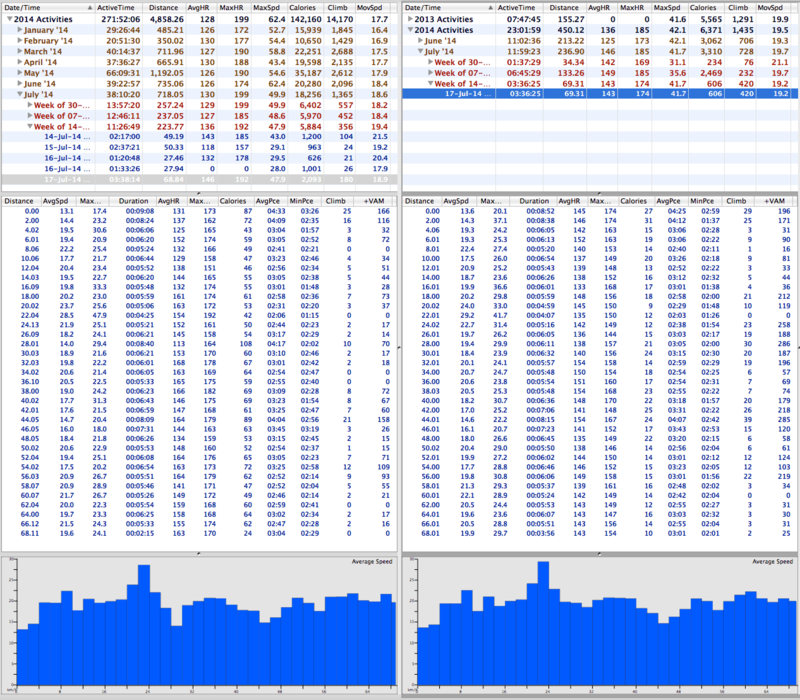 The calories figure is wrong for Klaus’s side (the right hand side) – somehow my software is reading the wrong thing. His software gave him 1800 calories for the ride. I was back at the car at 10pm so we were less than five hours on the road which wasn’t bad for a ride of this length and with a fairly good stop. Klaus usually rides these distances without stopping but I like having a loo break and a cup of tea if possible. I am still slightly amazed that I yet again didn’t manage to have a cake though!